You may be aware that Sheppard Chiropractic Centre offers laser therapy, but you may not be aware of what laser therapy can do for you. Who should ask about laser therapy? If any of the following apply…it’s you! Are you active on a regular basis? Maybe you play on a sports team, or enjoy working out solo. Perhaps you like to go hiking, biking or swimming. Exercise is good for you, but it puts you at risk for muscle strains and other sports injuries. Professional sports players, including baseball and basketball players, go for laser therapy. 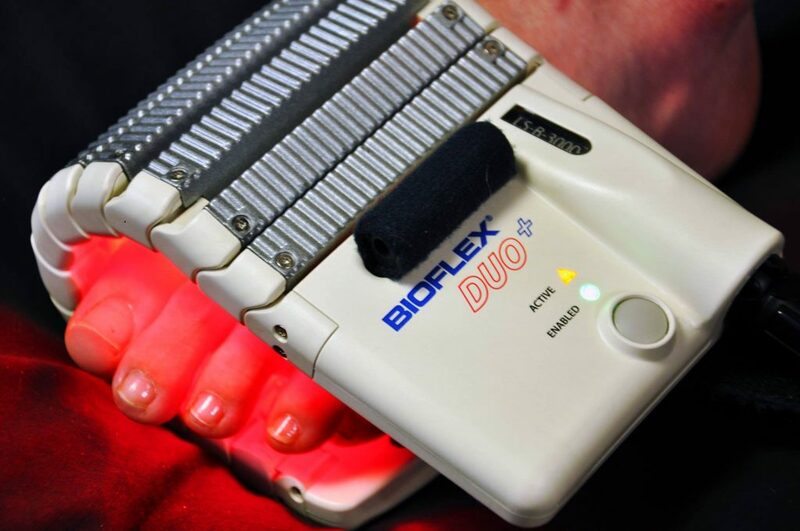 Laser therapy reduces inflammation and pain from sports injuries. It also promotes production of collagen, cartilage and muscle cells. Physical activity may put wear and tear on your body, but laser therapy can help you to recover from it – while also enjoying the health benefits of exercise. Arthritis is often painful and restrictive. Degenerative osteoarthritis is usually caused by wear and tear, trauma, or disease of cartilage around a joint. Laser therapy can reduce the pain and inflammation associated with arthritis. Tendonitis occurs when a tendon is acutely overloaded. During strenuous exercise, an Achilles tendon can be loaded with up to ten times a person’s weight. Micro-tears and inflammation result from excessive overload. Laser therapy helps to reduce inflammation. Additionally, it promotes healing of the micro-tears. Laser therapy also benefits people with ligament and tendon tears! If your back pain doesn’t respond to conventional methods of pain relief, you owe it to yourself to try laser therapy. Laser therapy supports your body and stimulates the cells to promote healing. You may find a significant reduction of pain, or even complete relief, from laser therapy. Do any of those four factors sound familiar? If they do, and you’re not already a laser patient, call Sheppard Chiropractic Centre at (506) 635-8182 or (506) 847-7172. Laser therapy treats more health issues than just these four conditions. Come back next week to learn four more conditions that laser therapy can treat.